Need to figure out how to auto stamp multiple PDF? Question:I have an auto cad stamp which I am trying to apply to multiple PDF automatically. I also am hoping to auto fill the stamp with the name of the PDF. Is there anyway that this could be done? I was thinking I could parse the names of each of the files into a linked list and then using a loop to go through the list.I am not sure if this will work. Is there any solution on VeryPDF? Answer: According to your description, you need to auto stamp PDF by the name of the PDF. If so, VeryPDF has software named PDF Stamp GUI which can help you do the job easily. 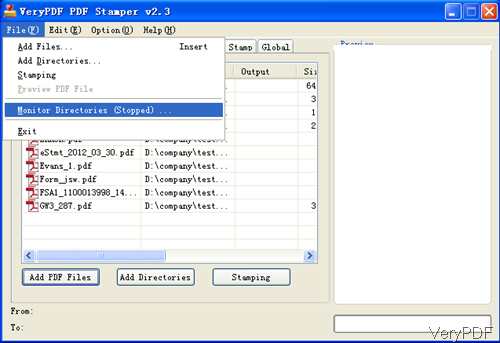 It allows you to monitor folders of input files, once files added to that folder then the PDF will be stamped at once. You do not need to do anything, all the stamp process could be done automatically. Please check more information of this software on homepage, in the following part, let us check how to use this software. Please download the GUI version, the command line version does not have the function of monitoring folders. This is Window application, when downloading finishes, there will be an exe file. Please install this software by double clicking the exe and following installation message. When installation finishes, there will be an icon on desktop, simply click it then you can launch it. The following snapshot is from the software interface, please have a check. Like I showed in the above snapshot, please click option File then go to Monitor Directories then you will see the following snapshot. 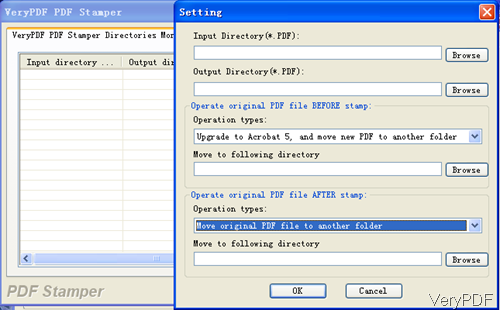 Simply click button Browse then you can add PDF folder to be monitored. Here you can set many folders to be monitored by various methods. When you finish setting, please click button OK to back to main interface. By this function, you do not need to do anything, all the PDF files in monitored folders will be converted at once. 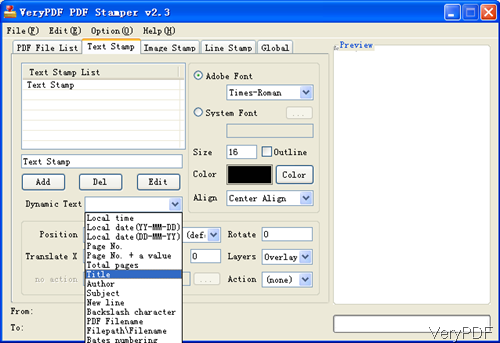 When you need to stamp PDF by file name, please back to main interface and then go to tab of Text stamp. Click button Add, in Dynamic text part, please choose Title like the following snapshot then you can make it. When you use this software, please make sure launch this software. Or at least let the application run in computer. 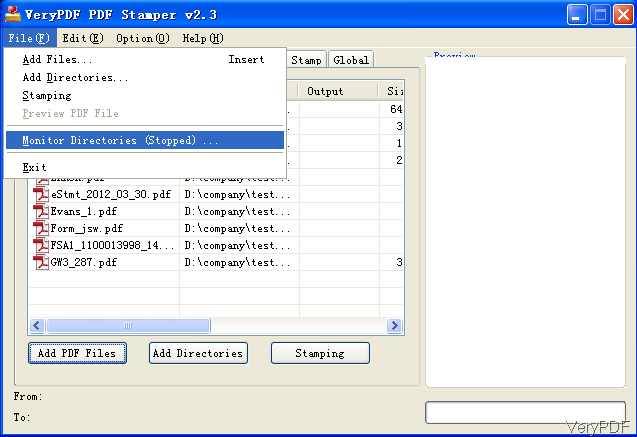 This software can help you stamp PDF by file name in batch automatically. During the using, if you have any question, please contact us as soon as possible. Does VeryPDF Stamp support a dynamic date stamp? How to choose page range when stamp PDF?